So I am back with the second installment of my reviews on various mangas. This time we are going to look into one of the most popular manga out there; 2005 Shogakukan Award winner – Tite Kubo’s Bleach. 1. Shōnen or Shounen (I will be calling it Shounen here after) – Mangas are divided into various genres and categories. While genre is decided as per the story, category is based on what audience it is aimed at. A Shounen manga is any manga aimed for male audience of age roughly 10 and up. Basically it is boys stuff. Boys who are just growing up; so it is light to digest and not too mature but has some sense and is not completely childish. (Obviously there are exceptions) Shounen is one of the most popular genre/category of manga. (Especially outside Japan). 2. WSJ and HST – This is basically for newbies. WSJ stands for Weekly Shounen Jump which is Shounen Manga anthology magazine. It is published by Shuiesha, one of the biggest publishers in Japan. While HST stands for Holy Shounen Trinity. They are 3 most popular mangas serialized in WSJ namely – One Piece, Naruto and Bleach. 3. Anime – Anime are animated tv series normally originating from Japan. They can be differentiated from cartoons for their mature themes. Anime may or may not be based on manga. Bleach does have an anime running but I am not gonna talk about it. Anime many times has lots of fillers involved which are included so that mangaka(author) gets time to take story forward just in case anime catches up. This may make anime look bad despite manga being good since most of the times mangaka isn’t involved with filler stories. Secondly bad animation/voice actors may cause the same effect. Again anime is available dubbed and I don’t really rely on dubs since they may kill the real essence of the story. So we are strictly gonna stick to manga and no comments on anime. Lets begin now..
Bleach is a manga about Shinigami or Soul Reapers. Ichigo Kurosaki is a gifted boy with ability to see dead. 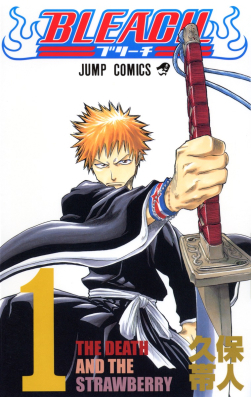 He accidently stumbles upon a Shinigami Rukia Kuchiki, who is forced to donate her powers to him and Ichigo becomes Shinigami himself and starts fighting evil souls called hollows. He later undergoes different missions on behalf of Rukia from Soul Society which is governing body of Shinigamis. Then finally you get to see an proper antagonist – Sosuke Aizen – and Ichigo helps Soul Society defeating him and later an evil group Xcution. Currently they are fighting a group of Quincys – Vandenreich – and more of Ichigo’s origins is being revealed. Then there are his friends and detailed accounts of all the fights which should not be disclosed here and should be read in the manga itself. I am gonna write about better things first. Some of the characters in bleach are simply awesome. Sosuke Aizen(above) is one of the best villains in Shounen mangas. He is no non-sense villain with extremely high intellect combined with wicked mind and intentions. Ichigo’s character is also appreciable and he is a good protagonist. Rukia’s character is also worth a mention. Orihime, Chad and other Ichigo’s friends are not that bad either. There are some more but I don’t want to spoil your fun. Kubo does put a lot of effort in making his characters stand firm. His art is also good. 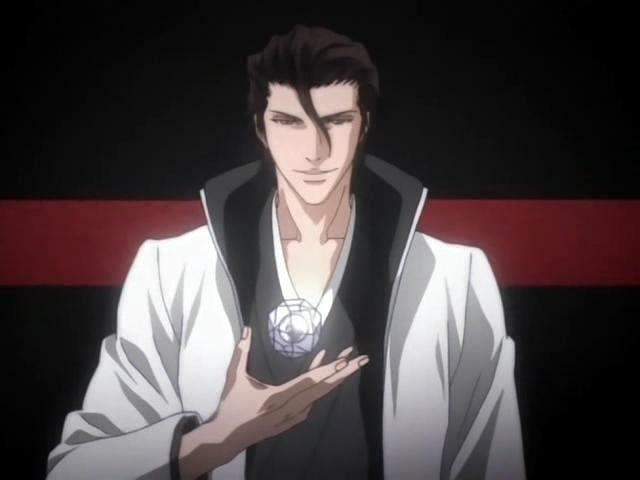 Especially the simple changes in Aizen’s face turning him from good guy to bad guy is commendable. He depicts fights pretty well through his drawings which are key to his success. Story. The biggest problem is Kubo so far hasn’t managed to support all his work on characters and their illustrations with a solid storyline. Not only he leaves loopholes but also fails to provide a proper flow. What exactly is Ichigo’s final fate? Or just more and more super villains are gonna keep coming? Clearly Bleach shows its influence from Dragon Ball here but in contrast fails to keep the interest intact in the later part of the series. Personally, and you will hear it from lot of people, it should have ended with emphatic defeat of Aizen. It would have been a fitting conclusion leading Ichigo back to a normal life. But Kubo had other plans and we get a troll in form of timeskip. I dragged myself through the fullbring arc. Current arc is little better but still not so good. Secondly characters are overpowered. It is actually miraculous that Ichigo manages to beat Aizen who at that point powers up like hell. Even Ichigo himself is overpowered like anything. None of the stuff is completely original and is often influenced by something. Bleach is no exception and shows clear influence from Yu Yu Hakusho by Togashi Yoshihiro. It is not a bad thing at all and Bleach actually does good job on building upon influences from YYH. What I want to say is if you like Bleach, please do read Yu Yu Hakusho as well. Bleach is a good manga. It may not be legendary but then not all can be extremely good. Lately it has been low on quality and it is resulting in its drop in popularity. I will say read till chapter 423 and after that its upto you. But if you want more scary looking Reapers Bleach is not the manga for you. I will rate Bleach 69/100 as it is pretty good. Next time we will try some other genre as we will be looking for a master thief 😀 See you next time. hi!,I love your writing very much! share we be in contact more approximately your post on AOL? I need a specialist on this space to unravel my problem. May be that’s you! Looking forward to peer you. First of all thanks for appreciating the post. The thing is I’m not a regular blogger. So I may not be available all time. So sorry to say but perhaps I am not the specialist you require. But yes I recommend you to stay tuned to this series as many more reviews are coming up. Also you can share these reviews and use them to reblog.